I had about 8hrs of driving to get back to San Jose this evening, so rather than try to schedule a full day of peakbagging I settled on a single outing I could do easily in the morning. Flattop Mtn is found in Andy Zdon's Desert Summits, one of several in this area around Needles. Zdon's driving instructions, appropriate for high-clearance vehicles, allow one a very short hike from the northwest of around 3mi roundtrip. Without such a vehicle, I chose to hike from I-40 to the north, about 7.5mi roundtrip. Interstate 40 is unique in CA as far as I can tell, where normally interstates allow only for emergency parking, I-40 has no such signage for most of its length between Barstow and Needles. There are many dirt/gravel connectors between the eastbound and westbound directions and I used one of these to park at. I figured without such signage this was perfectly legal, but I'm not entirely sure about it - when I returned I had a warning note from the CHP indicating a vehicle can be removed if parked for more than 4hrs. My time parked there worked out to about 45min short of the maximum time - lucky me. The initial mile travels through the northeast corner of the Bigelow Cholla Garden Wilderness following an old mining road. 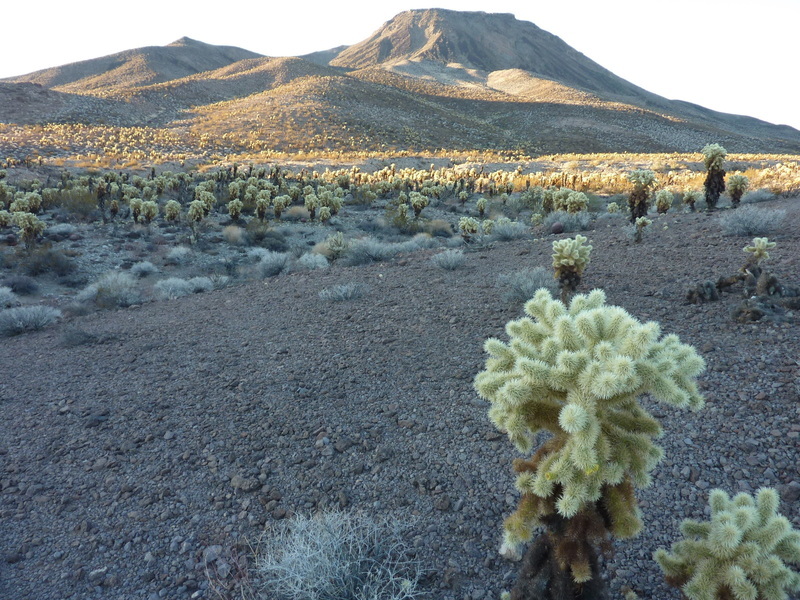 The cholla cactus are not to be taken lightly as the "garden" label is horribly misleading. These are possibly the most evil cacti growing in the state, with hooked needles that are painful to remove and nodules that break off easily and litter the grounds where these grow. Passing animals (and humans) can easily detach nodules for transport to new areas, a very ingenious, albeit evil method of habitat expansion. I stepped carefully through the areas where I found these, finding alternate ways on the return. After the first mile I picked up the nearly straight pipeline road described by Zdon. I followed this southwest for half a mile until reaching a wash north of the summit. I utilized this wash and the NE Ridge of Flattop to attain the summit. The lower third of the mountain was festooned with a wide swath of cholla that took some careful navigating and motivated me to find another way down.